I love this, having smooshed a whole bunch I agree almost completely, apart from the Farmer - the pig stands out just like the queen's dress, just feel the legs then move one hand to the head and the other to the backside of the pig - if there is no long tail you have a pig and hence the farmer. So I would go for pig first, then hat then pitchfork (which is flat and sometimes difficult to find due to being squeezed together with the baseplate. I need to check my TRU and see if they got these in. I'm excited...there are definitely a few in this series I want. If you're not doing this with a sorting tray you're doing it wrong. Or with an apron with 16 pockets. You're taking a sorting tray to the store? Someone has to dig up that reference for those that missed out. We have a Hall of Fame for this sort of thing. Yes just the other day. It turned out to be a very nice conversation - I showed him what I was looking for, how I knew what I had, and we talked about the perceived value of LEGO. Then he told me that another customer in the very same store found a Mr. Gold a while back. Net, all was well - and it's not like you are doing something illegal like opening the bag and checking, or damaging the contents. That might be the thinking of the LEGO Group, but why would the retailer care? If you buy 16 CMF bags, that's a nice sale for them .... and the mommies with begging kids don't care what minifig the kid picks, they just think "here is a nice little reward for patiently spending 2hrs in stores with me". I don't know if its due to my 'smooshing practice' or if this series is just easier to 'smoosh' than the series before, but I was able to get all mini figs I wanted. funny, i did not know any terms and conditions applied to CMF purchase. i pay for what i buy, if it takes me a few minutes to decide what i want what is the issue with that? Actually, I have seen LEGO store employees helped customers smoosh the packages to get specific characters and chatted with them throughout the process. IMHO this is a good practice since those same customers ended up buying more than just a few CMF packs. 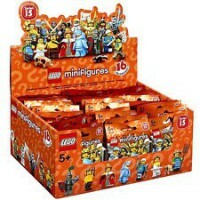 You could be right only if the price of minifigures would be much less than EUR 3, for example EUR 0.5 - 1 - then you can buy 50-60 minifigures to find 16 different figs. But expect to spend 3x eur 3 to get 1 new 2 and have 2 figs redundant (so to pay EUR 9 for new fig), its not fair. And you still cannot be sure that you have all 16 characters after buying 50-60 figs - since the amount of every fig is different in 1 box. So smooshing is absolutelly OK for me. Hey I'm all for paying less for your figures! I was just pointing out the strategy TLG uses to maximize their sales figures. In fact it's a very common technique. The most obvious example being trading card booster packs like Magic the Gathering.